Genesis Mega Turrican (USA) in 12:51.95 by maTO. In this installment of the Turrican series, the evil force known as "The Machine" has once again come to bring destruction in order to take over the galaxy. Once again, Bren McGuire is the only one who can save the galaxy from evil! This game was released as Turrican III for the Amiga before Factor 5 got Data East to port it to the Genesis/Mega Drive. 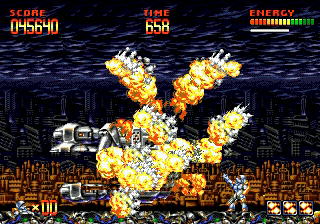 Like most of the previous games in this series, the protagonist has limited rolling power and limited use of super bombs. This forces the author to use some strategic choices to conquer these stages quickly, including occasionally dying to replenish bombs.